MacroScope-IIa- Makes C-Mount images of 4-10mm objects. QIOPTIQ-20- Images 10-20mm objects onto CCD-SM/SMQ camera. These lenses are designed to provide the largest possible numerical aperture when imaging 4 mm, 2 cm, and 5 cm diameter objects. The Macroscope-IIa forms a C mount image. RedShirtImaging provides optical couplers to reduce the image size to match the chips in our CCD cameras. The QIOPTIQ-20 and QIOPTIQ-50 optics are designed to directly image large objects onto the CCD chip of the CCD-SM and CCD-SMQ cameras. As an alternative to the specially designed QIOPTIQ devices, one can use a combination of our 0.38X coupler with a Navitar lens. This arrangement will allow imaging of a similar large field of view. Our MacroScope-IIa provides very high numerical apertures (NA) for low magnifications (2X and 5X.) Because the light intensity reaching the camera is proportional to the fourth power of NA, using a high NA lens has a very large effect. In a comparison with a 4X, 0.16 NA microscope lens, the MacroScope-IIa delivered more than 100 times more light. A carrier for user supplied microscope objectives is also provided so that both low and high magnifications can be used on the same preparation. * Lower magnifications and longer working distances can be obtained by removing the beam diverter. For the 50 mm lens the magnification becomes 2.0X and the working distance becomes 15mm. For a 75 mm lens (also included) the magnification is 0.7X and the working distance is 16 mm. # You can measure the field of view by putting a screen at the C-mount port and focusing on a ruler. In actual use we anticipate that the MacroScope-IIa would be attached directly to the camera or optical coupler via the vertical C-mount port. A beamsplitter and secondary port is provided if a higher spatial resolution image of the object is needed; obtaining a high resolution image would be most useful for measurements made with the low resolution PDA cameras. For the high resolution camera we use a Dage MTI CCD-300E-RC. 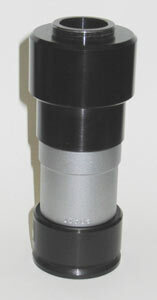 The optical coupler is made by QIOPTIQ Imaging Solutions (formerly Thales Optem, Fairport, NY14450, (585)223-2370). A Camera Carrier could be used for rough focus adjustment. We have mounted the preparation on an X-Y stage (#XY6060M20, Danaher Motion,7C Raymond Avenue,Salem, NH 03079, (800)-227-1066) which is in turn mounted on a Z-axis focusing device, 488 series Compact Laboratory Jack with Rotary Platform, (Newport Corp., Irvine, CA 92606, (800) 222-6440) which provides a convenient method for fine focus. In our laboratory the lamphouse-condenser-heat-filter-interference-filter subsystem is mounted independently on a Newport model 281 Laboratory Jack to facilitate vertical adjustment. However, if the lamp and Macroscope are coupled via a light guide, then the vertical adjustment problem is obviated. While the use of a light guide for illumination is convenient, David Kleinfeld (personal communication) said that in the best of circumstances there is a 40% loss of intensity in comparison with direct illumination using the lamp condenser lens. 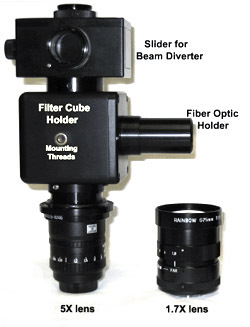 When using direct illumination the Fiber Optic Holder on the Macroscope can be removed. In addition we mount the shutter independently on a separate table to avoid interference from its vibrations. The user specifies the wavelengths for the incident light filter, dichroic mirror and secondary filter for a filter cube, U-M509 (U-MF/XL) purchased from Olympus which is then populated by filters from Chroma Technology, Rockingham, VT 05302, (802) 428-2500. Additional filter cubes can be obtained from Olympus-Chroma. If oblique illumination is used the dichroic mirror can be removed. These lenses were custom designed by Qioptiq, Inc. (formerly Qioptiq LINOS Inc.) to maximize the light collecting efficiency from large objects onto the CCD chip in the -SM and -SMQ cameras. The lenses have a male C-mount on one end that screws into the camera. The working distances of these lenses is very large (greater than 5 cm, see table below) making it easy to insert a secondary filters into the light collecting path. Oblique epi-illumination can be implemented. Transmitted light measurements can also be made.